Albion Rovers manager James Ward is convinced his side will be Scottish Cup semi-finalists after they drew 1-1 at Ibrox to force a replay with Rangers. The Coatbridge men led through Ciaran Donnelly's first-half strike as they threatened to shock the hosts. Rangers equalised through a contentious late leveller from Bilel Mohsni, but it did not dampen Ward's confidence. 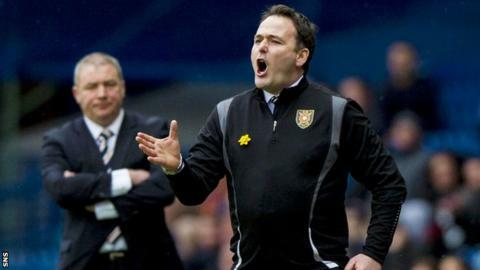 "I've told you before the game and I'll tell you again - we're going to beat them," he told BBC Radio Scotland. The two sides meet again for the quarter-final replay on 18 March at Hamilton Academical's home, New Douglas Park. And Ward believes his men should have no fear after holding Ally McCoist's men. "I said before the game I've got absolute faith in that group of players in a one-off occasion," he said. "We obviously weren't going to come here to entertain the whole crowd, we came here with a plan and I think the boys stuck to it fantastically. Their effort and application was fantastic. I'm so proud of them. "In each and every round, and today, they've gained in confidence. "They've realised what they're capable of achieving as a team, and hopefully that allows us to go and win the replay now. I remain 100% convinced that we can go and win against Rangers. "Rangers have their problems to contend with. They're the people who have higher expectations than us. But I have an utter belief in that group of players that we'll go and win that replay now." At the time of Mohsni's equaliser Rovers players were furious, feeling the Rangers player had fouled goalkeeper Neil Parry. However, Ward preferred to praise his heroes for their performance. He said: "In the heat of the occasion referees have to contend with decisions. They get some right and they get some wrong. "But, we're still in this cup tie and there's no point me taking any focus off what my players have done. "My players have been absolutely immense, and the focus should be on them not on anything else. "The players' effort, it was out of this world. I think you can see the reaction of the fans - they'd went quiet because I think they were scared of what was possible."